Published by A & C Black, 2006. 256 pages. 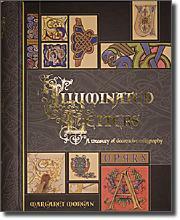 (US edition: The Bible of Illuminated Letters, publ. Barron's Educational Series Inc.). 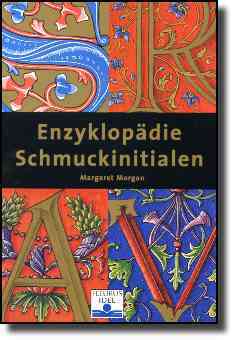 Also available in French - Lettres Enluminees and German - Enzyklopadie Schmuckinitialen. 400 high quality full colour illustrations, step-by-step projects and a gallery of inspiring modern work using traditional techniques. This richly illustrated book contains six complete historically-based alphabets, from 7th to 16th centuries and extensive information on all materials & techniques needed to complete these beautiful decorated letters. It is based on ten years of personal research into historical illumination styles at the British Library. 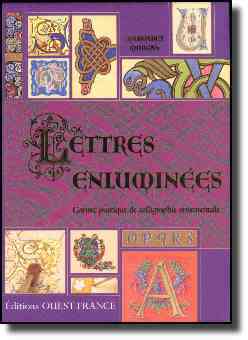 Designed for anyone interested in historic decorated letterforms, it has become a standard reference work for the practice of illumination, used and recommended by many well-respected tutors. This book is also available in French, German, Italian, Spanish, Dutch and Russian. (First publ. as Calligraphy - a guide to hand-lettering, 2001, UK & US). Published by New Holland, 2005. Something of interest for all calligraphers - information on materials & equipment; useful script exemplars and interesting techniques with unusual tools, colour effects etc. Eleven projects to put the techniques into practice. A different way into calligraphy and lettering, starting without any special tools or materials. 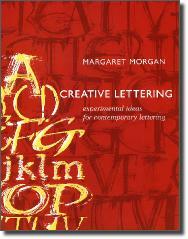 Includes techniques and experimental ideas for beginners and more experienced calligraphers alike. A useful resource for school art teachers.